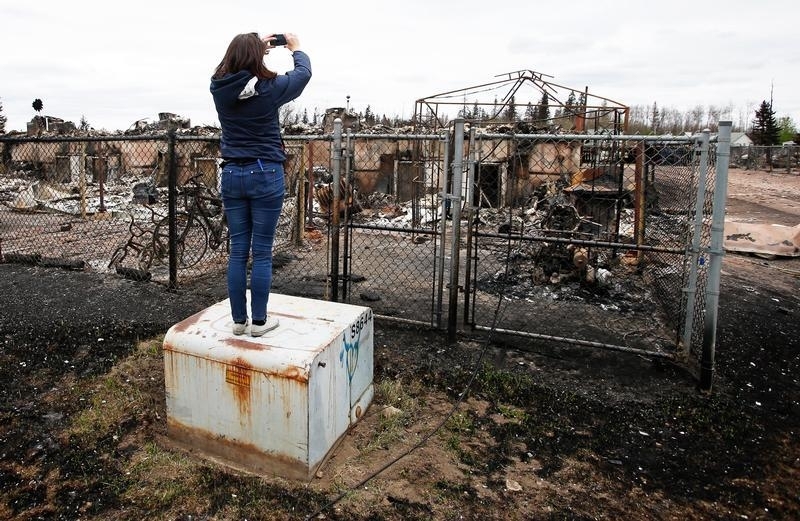 Fort Mcmurray - Canadian officials on Monday got their first glimpse of the oil sands boomtown of Fort McMurray since a wildfire hit and saw a “heartbreaking” number of destroyed homes but a largely intact downtown business area. 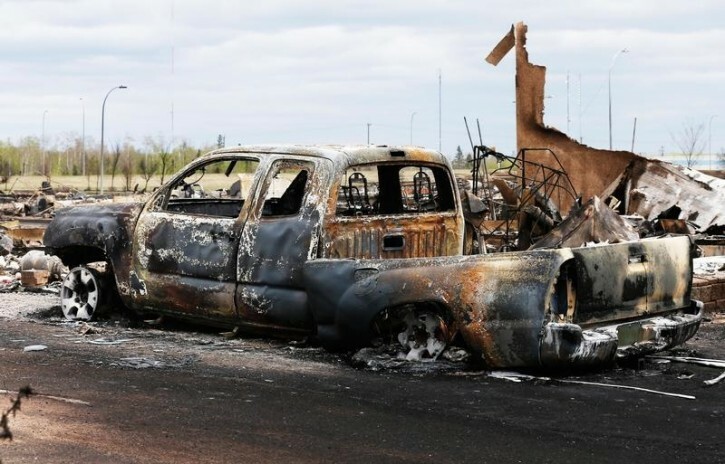 The fire that has ravaged some 161,000 hectares (395,000 acres) of Alberta moved far enough away from the evacuated town of 88,000 people to allow an official delegation led by the province’s premier, Rachel Notley, to visit. “Massive residential damage ... couldn’t keep track of the unaffected streets. Large portions destroyed,” Ward Councilor Tyran Ault said on Twitter, adding that the neighborhood of Beacon Hill was in “heartbreaking” condition. That assessment came a few hours after insurance experts revised sharply downward their estimates of the cost of damage from the blaze, which began on May 1. Canada’s largest property and casualty insurer Intact Financial Corp expects to suffer losses ranging from C$130 million to C$160 million ($100 million-$123 million) from the wildfire. Intact used satellite imagery and geocoding technology to see if buildings were a total loss or partially destroyed. Analysts said Intact’s forecast implied overall industry losses of between C$1 billion C$1.1 billion ($769 million-$846 million), much less than the earlier forecast of C$9 billion ($7 billion). 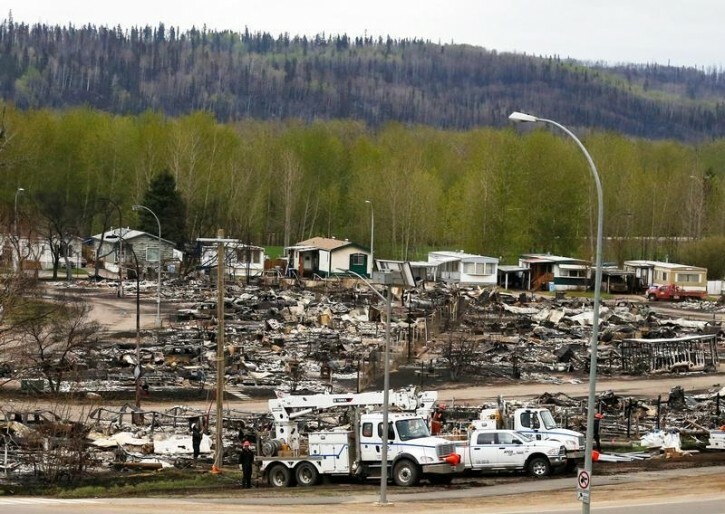 Prime Minister Justin Trudeau vowed a multi-year commitment by the national government to rebuild Fort McMurray after the most destructive Canadian wildfire in recent memory. 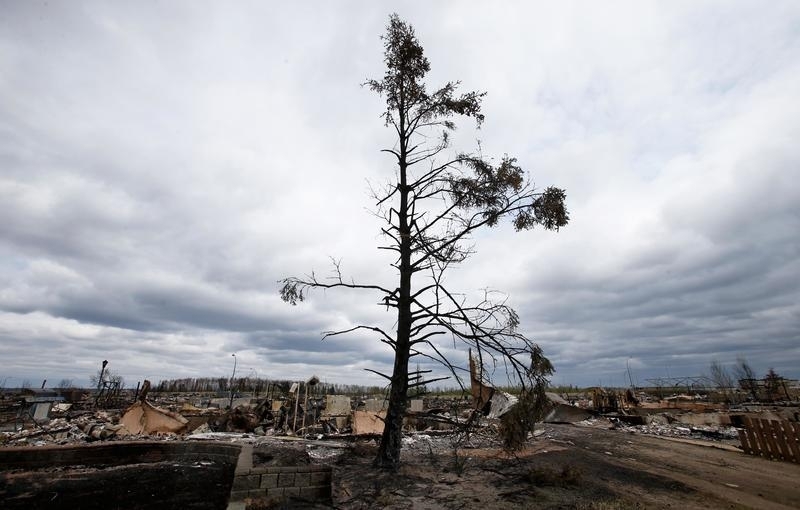 “We will support and invest in rebuilding Fort McMurray in a broad range of ways in the coming days, weeks, months and yes, years,” he told reporters in Ottawa, but gave no details. Fire officials said that cooler weather had slowed the fire’s spread. But its course remained unpredictable on Monday, and Alberta wildlife information officer Travis Fairweather said wind could have a big impact. Illustrating its unpredictability, officials ordered the evacuation of two hamlets south of Fort McMurray, home to a combined population of 530 people, at midday. The orders were lifted less than an hour later. Temperatures cooled on Monday, with a forecast high of 50 degrees Fahrenheit (10 degrees Celsius), down from Sunday’s high of 63 degrees Fahrenheit (17 degrees Celsius). The cool weather was expected to linger through Thursday, according to Environment Canada. Still, much of the province of Alberta in western Canada is tinder-box dry after a mild winter and warm spring. “This beast is so big, we need rain to fix it,” Public Safety Minister Ralph Goodale told reporters on Monday. Government weather forecasts show the first possibility of rain on Wednesday with a 30 percent chance. Officials said it was too early to know when the thousands of evacuees camped in nearby towns could go back to Fort McMurray, even if their homes were intact. The city’s gas has been turned off, its power grid is damaged and the water is undrinkable. Fort McMurray is the center of Canada’s oil sands region. About half of its crude output, or 1 million barrels per day, has been taken offline, according to a Reuters estimate. Statoil ASA said it will suspend all production at its Leismer oil sands project in northern Alberta until midstream terminals needed to transport crude oil via pipeline reopen. Its move followed shutdowns of Nexen Energy’s Long Lake facility, Suncor Energy’s base plant operations, the Syncrude project and Conoco Phillips’ Surmont project. Nearly all of Fort McMurray’s residents escaped the fire safely, although two teenagers died in a car crash during the evacuation.